(TORONTO, ON – November 11th, 2016) The Corolla iM is for the person who makes things happen – whether it’s a weekend getaway or the road trip of a lifetime. With plenty of style, comfort and driving fun – plus space for friends and gear and advanced safety features that are just plain smart – the Corolla iM is ready for anything. The iM was introduced in the 2016 model year as a Scion model. Now, it joins the Toyota Corolla line-up, adding a versatile hatchback configuration to the world’s all-time best selling automobile. For 2017, the iM gains heated front seats as standard, plus the addition of Toyota Safety Sense C – a package of active safety technologies including the Toyota Pre-Collision System, Lane Departure Alert, and Automatic High Beams. 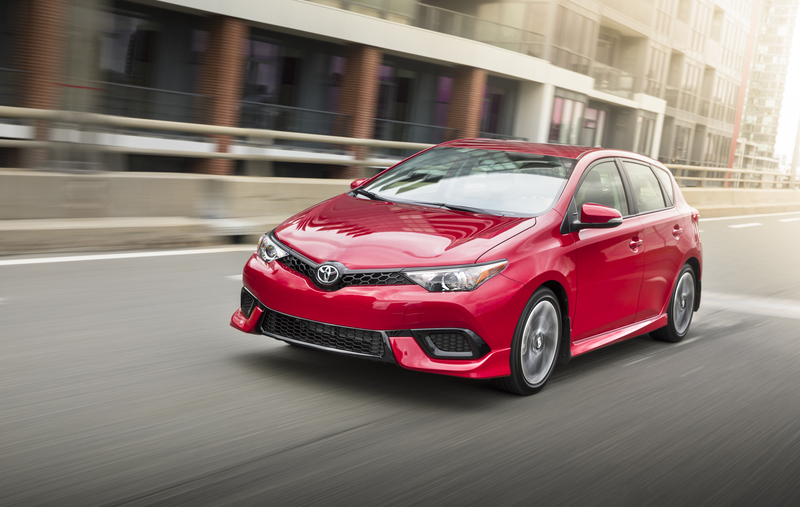 The 2017 Toyota Corolla iM looks great and is fun to drive. It’s the perfect vehicle for today’s spirited, urban citizens to proudly call their own. Regardless of transmission, the 137 peak horsepower 1.8L four-cylinder engine with Valvematic technology delivers a winning combination of confident acceleration and impressive fuel efficiency. The six-speed manual transmission is engineered to provide smooth, quick shifts with a sporty-feeling clutch, while the advanced Continuously Variable Transmission with intelligent shift (CVTi-S) features seven stepped shift points. A double wishbone rear suspension ensures a comfortable ride for all, even those in the back, while wide tires on 17” alloy wheels provide a lower centre of gravity and lower rolling resistance. The Corolla iM has a sporty, sleek body with honeycomb grille, full skirting package and rear lip spoiler as standard, making the iM one of the most aggressive looking hatchbacks on the road. Inside, the cabin offers comfortable seating for up to five adults, while the 60/40 split folding rear seats created up to 588 litres (20.8 cubic feet) of cargo space. Driver and passengers are surrounded with premium finishes for a sophisticated look and feel, including a piano black instrument panel trim accent. The Corolla iM’s long list of standard equipment include premium features like a 7” Display Audio system with voice recognition, Bluetooth and steering wheel-mounted controls, dual-zone automatic air conditioning, a 4.2” multi-function display, leather-wrapped steering wheel and shift knob, and more. Safety is always standard on a Toyota, so in addition to the new Toyota Safety Sense C (TSS-C) package, every 2017 Corolla iM is equipped with active and passive safety features, including eight airbags, the Toyota Star Safety System, whiplash injury lessening front seats, a tire pressure monitoring system, LED tail lamps and daytime running lights, a back-up camera, and more. For complete and up-to-date details and specifications on the 2017 Toyota Corolla iM, visit www.toyota.ca. To learn more about Toyota Safety Sense, visit www.toyota.ca/toyota-safety-sense/en.